Great home ready for a new owner to love as much as the current owner. 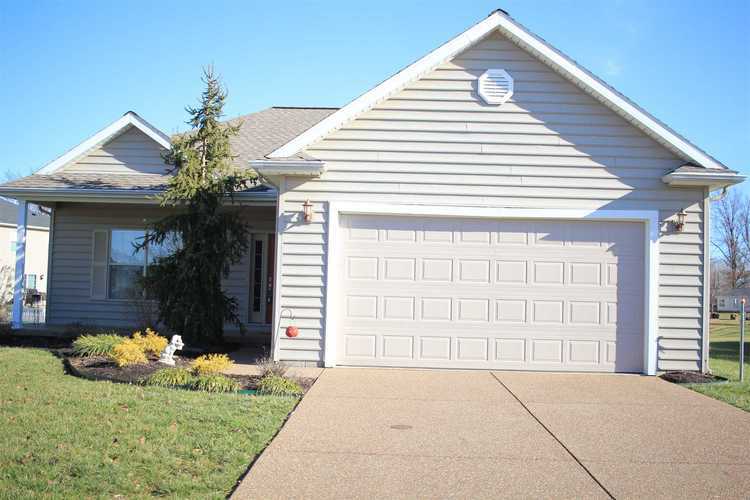 You will be greeted by beautiful professional landscaping by Stocker’s and a large open front porch. Step inside to a spacious great room that opens to the kitchen and dining area. Kitchen features: castled cabinetry, a large pantry, stainless steel appliances, newer upgraded DW, MW, new faucet, under cabinet lighting, eating bar. Beautiful view from the dining area through the extra tall patio door. Master bedroom has access to the covered back porch and has a view of the lake. Nice walk-in closet, master bath with double sinks, new step-in shower, glass block window, newer carpet. Other 2 bedrooms have large closets and are split from the master. Nice hall bath. Laundry room has shelving – front load Samsung W/D with drawers are included. Soft wall colors, 9’ ceilings, finger groove molding. There is a new wireless garage door opener. 200 amp electric. HVAC 2 years old, 98% efficiency with an Aprilaire Air filter. Relax on the covered back porch and enjoy the lake. Lot extends into the lake. Lovely home with a spacious feel. Directions:North on Hwy 41, East on Baseline, North into Fenway Park (approx. 1/4 mi. ), Left onto Candlestick, Right onto Wrigley. Home on right.